4 Pics 1 Word girl with hat. Sheep. Ewe. Little lamb. Older couple. Child with skateboard. Thanks for visiting 4-Pics-1-Word.com, here are the cheats for your favorite game. 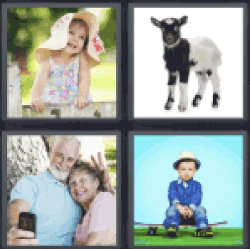 4 Pics 1 Word girl with hat.